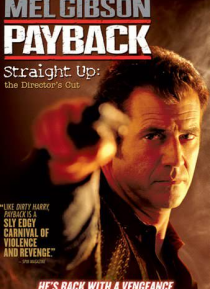 Mel Gibson gives an unforgettable performance in this explosive film from director Brian Helgeland, which features a superb supporting cast including William Devane, Maria Bello and Lucy Liu. The Director's Cut allows you to see PAYBACK like you've never seen before: through the eyes of its director. Experience a different version of Porter's (Gibson) drive to avenge those who took his money and l… eave him for dead. Witness the real PAYBACK.